Michigan voters will now decide if Michigan should join states like Colorado and Washington in legalizing marijuana after Speaker Tom Leonard announced the House will not vote on the proposed ballot initiative. Leonard's announcement comes a day after Senate Dem Leader Jim Ananich said that any Republican leader who thought the proposal would receive Democrat votes in the legislature had "already started smoking something." The issue presents both parties with complications. Polls show around 60% of Michiganders support the idea of legalization, and the proposal is likely to pass. The opposition campaign is led by Healthy and Productive Michigan, an anti-legalization group led by political consultant Scott Greenlee. Congressmen Mike Bishop and Justin Amash both face primary challengers after opponents filed against them at the last minute Tuesday. Bishop's opponent, Lokesh Kumar, owns Eisen Electric in Lansing. "Eisen Electric Corporation is a diversified manufacturer of industrial components...Our operating scope includes the design, manufacture and supply of engineered fasteners, machined parts, stampings, current carrying devices and switchgear for customers around the world. With business units operating in the United States and India employing a workforce of approximately 120 dedicated people, our group is ideally positioned to support customers globally." 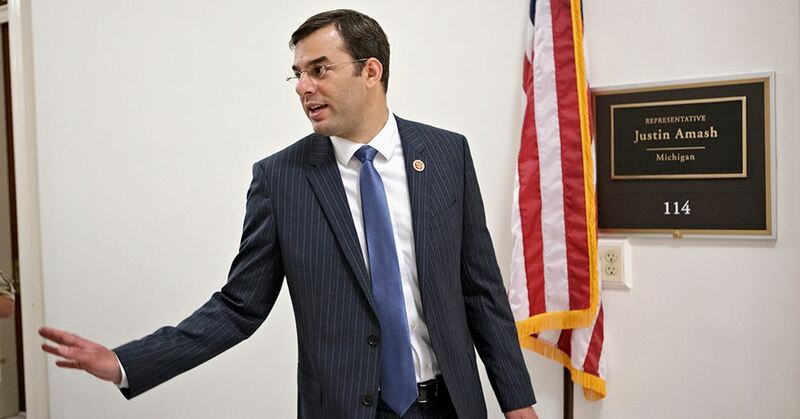 For Amash, he'll face Joe Farrington, a local trustee from the small town of Lyons. The hot issue in Lyons recently? A stray cat who found a home at the local library and became a fixture in the community was booted, a move Farrington opposed. "Aww Kitty was one of 39 cats that lived at libraries in the United States, said the American Library Association. She now lives at a resident’s home. Board members insisted they’re no Cruella de Vils. They said they had to look out for all library patrons, not just the cat-loving ones. “If it’s people versus a cat, people are going to be the one I vote for,” said board member Marilyn Huhn. This central Michigan village has always struggled to catch a break, residents said. First the railroad passed it by and then the highway. The company town lost its company in 1979 when Chrysler closed a trim plant. Isolated amid fields of corn and soybean, the closest medium-sized city, Lansing, is 37 miles away. The population is 789. When Joe Farrington moved here in 2013, he described Lyons as the Meth Capital of Michigan. There were thefts, home invasions and junkies roaming about at all hours, he said. Two years later, 21 homes in the rural county were condemned because they were contaminated with methamphetamine residue, county officials said. Now the most pressing concern is a library cat. Farrington, now a village trustee, counts it as progress. “It’s a testament to the people of Lyons,” he said. Developing: Will Maturen Drop Out To Avoid Bruising Primary Battle With Matt Hall? It's easy to see why MIRS named Hall the most serious primary threat out of the 20 races with incumbents who face challengers: Maturen faces many obstacles in his uphill bid for a third term in the House. He has voted for the gas tax hike, vehicle registration fees, and multiple other terrible money grabs. Maturen was part of the "dirty dozen," 12 GOP House members who voted against a marginal income tax cut. Maturen is also hostile to the pro life community and has never received the endorsement of Right To Life, one of only two current incumbents who fail to meet their criteria. Sadly, he is even a Never Trump who does not support our President. "Asked about the Presidential election, Maturen says he never tells anyone how he’s to going to vote. But Maturen says he won’t endorse the Republican nominee Donald Trump. Maturen says Trump’s misogynistic comments don’t sit well with him. 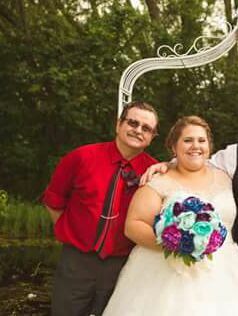 He has been married for 45 years and has three daughters. Maturen served in the army from 1971-73 during a time when John McCain was being held prisoner in Vietnam. Maturen says Trump is out of bounds to say McCain wasn’t a hero. Maturen is also bothered by Trump’s comments about Mexicans because his son in law is a Mexican national. Maturen says it would be hard to face his family if he endorsed Trump." Maturen will also likely face immense scrutiny for nearly killing a family in a car accident because he was not paying attention to the road!
" State Rep. Dave Maturen "traumatized" a family he narrowly missed before getting into a fiery car crash a week ago. The wreck occurred while Maturen was headed to Battle Creek to meet Legislative Director Sherry Sofia and participate in the Grand Cereal Parade on Friday, June 9. According to an incident report from the Kalamazoo County Sheriff's Office, Maturen was ticketed for being unable to stop in an assured clear distance in the crash. At approximately 5:33 p.m., Vicksburg resident Julie Kuber, carrying her fiancee's 9-year-old daughter and a friend's 10-year-old daughter, began to slow down at the intersection of 38th Street and MN Avenue north of Climax Township. Her fiancee, 15-year-old son and his friend began turning their 27-foot-long recreational vehicle left onto 38th Street when Maturen approached them from behind. Undersheriff Paul Matyas said Maturen wasn't paying attention to the roadway. By the time he noticed the vehicles stopped ahead of him it was almost too late. "I (told the girls) bear down, because this guy is going to hit us," Kuber said. "I'm watching and there's nothing I can do." At the last second, Maturen swerved out of the way and lost control of his vehicle, which turned off the road and hit a tree. Kuber said the impact sent Maturen's vehicle sailing through the air before landing on its side. "The whole car flew," she said. "Thank God that he swerved the last minute. If he hit us something very bad would have come out of it." You get the picture. Maturen would be weak against almost anyone, but Matt Hall presents an enormous challenge. Hall, a Michigan Republican Party State Committee member and lawyer, is said to be willing to spend well over $100,000 to beat Maturen. He has already been hitting doors in the district according to Facebook posts. 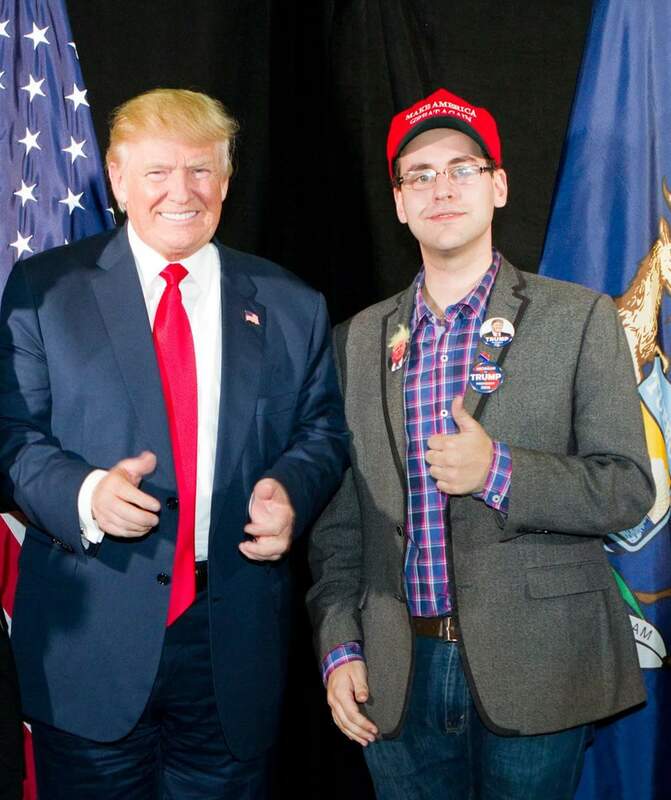 Hall was a delegate for Donald Trump in Cleveland in 2016 and the 3rd District Chair for the campaign. Hall led the effort to remove Wendy Day from her position as MIGOP Grassroots Vice Chair after she publicly opposed Donald Trump on a local TV show. Maturen currently has around $60,000 on hand if he chooses to run again. MIRS has identified Maturen as extremely vulnerable. 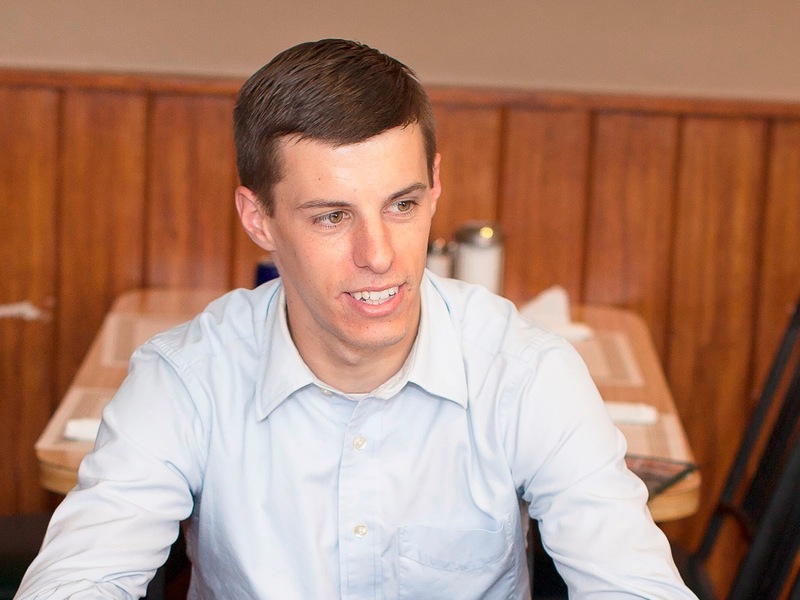 "Michigan Republican State Committeeman Matt HALL announced today he would be challenging Rep. David MATUREN (R-Brady Twp.) from the incumbent's political right, marking potentially the most serious primary threat of the 2018 primary cycle," they wrote Tuesday. "Hall, who actively flirted with running for Congress last year against U.S. Rep. Justin AMASH (R-Cascade Twp. ), said he's rounded up support in the 63rd House District to take out the two-term House member, who Hall called a "liberal." 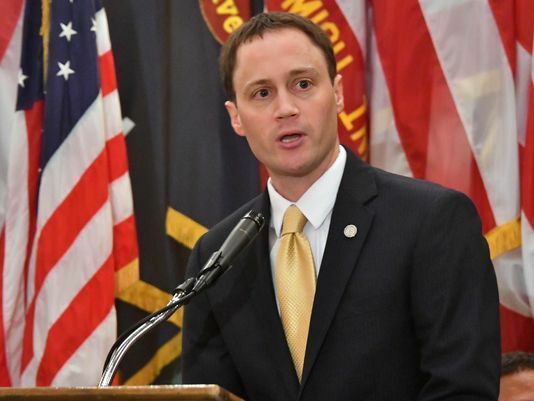 "Maturen is consistently rated one of the most liberal Republicans in Lansing," Hall said. "He's voted for high taxes and against lower auto insurance rates. He's voted against the sanctity of life, our Second Amendment rights and English as our official language." Hall is a constitutional law attorney and longtime conservative grassroots activist." Beating a sitting State Rep. in a primary is immensely difficult: before Lee Chatfield kicked Frank Foster to the curb in 2014, it hadn't be done in decades. It CAN be done though, with the right message, a lot of doors, and a little money to play with. Matt Hall is well positioned to take a page from the Chatfield playbook if Maturen stays in, and it will be one hell of a race. 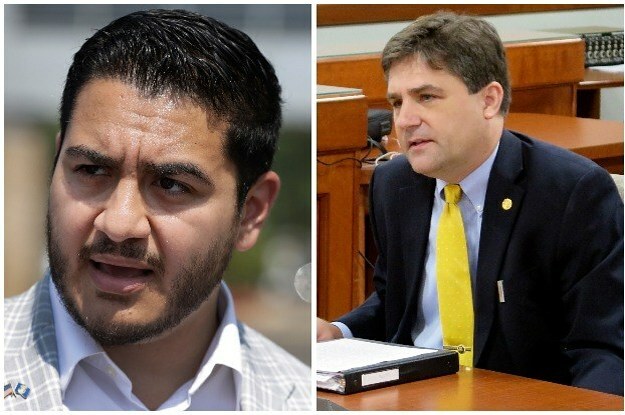 State Senator Patrick Colbeck has found himself in the middle of a heated controversy involving Democrat candidate Abdul El Sayed's alleged ties to the Muslim Brotherhood. Michigan media outlets have started to pick up on the controversy, even causing Fox News host Sean Hannity to rescind his endorsement of Colbeck because of the issue. For Colbeck, this is an opportunity. He is getting earned media coverage on an issue the Republican base is friendly to, and Colbeck needs to drastically improve his name ID. Challenge El Sayed to a debate? Hold a press conference or issue a press release fully explaining your position and why you are correct? Colbeck can keep this story going if he'd like, and why not? It's also a win for El Sayed with his progressive base, and he can use the help too. 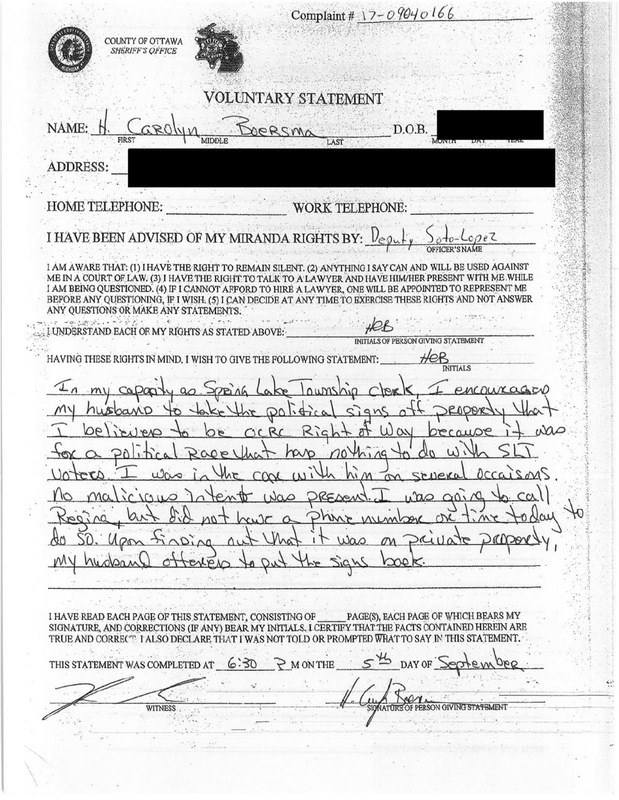 He has already used Colbeck's comments to raise money online. It's only late April, but the clock is running out. Absentee ballots will be going out before you know it... As Schuette and Calley battle while Shri and Whitmer duke it out, El Sayed and Colbeck need to start breaking through, here's a chance. "In the videos, Colbeck told a group in April that only he can defeat El-Sayed. Using slides, Colbeck calmly expressed fears that Muslims, through powerful lobbyists and ascendant politicians, were trying to bring “sharia law” to Michigan, “push Islam into our churches” and “exercise influence” over the entire state by reaching the state’s top political post. “There are a lot of pressures that are being applied in our society right now. You’re seeing Muslim legislators in the state legislature and you’re seeing also a push … at the local level,” Colbeck said as he showed a slide with El-Sayed’s photo. Businessman Sandy Pensler made his US Senate campaign official today, filing nearly 30,000 signatures with the Secretary of State. 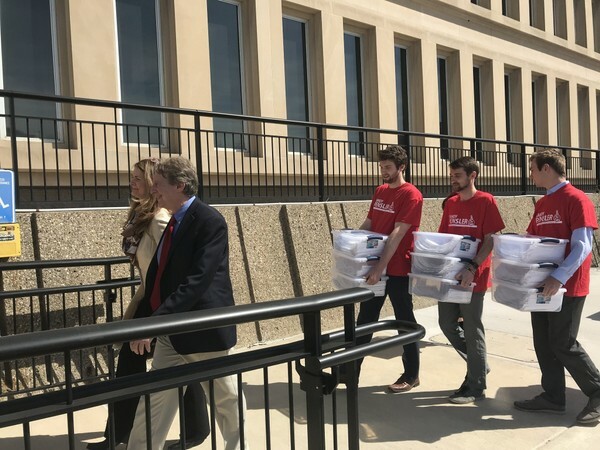 "Pensler, a Grosse Pointe businessman and economist, said he turned about 27,000 signatures collected using a mix of paid and volunteer petition gatherers. Statewide candidates need at least 15,000 valid signatures to qualify for office. Pensler formally announced his candidacy in November 2017. He is the president and founder of Pensler Capital and previously taught economics at Harvard and Yale. "I'm fully committed to securing our borders, fighting for lower taxes and cleaning up Washington," Pensler said in a statement. "I have a plan to create jobs and put Michigan First and the resources to run a successful campaign." Around the same time, Sen. Debbie Stabenow announced she has over $8 million in the bank for her re-election campaign. Stabenow's $8 million doubles Pensler's $4 million on hand. John James has a little over $1 million after having his best fundraising quarter yet, nearly quadrupling his number of donors. It is yet to be seen if historic preservationist Bob Carr will file signatures. Carr has raised around $4,000 and had $3 on hand according to his last FEC report. 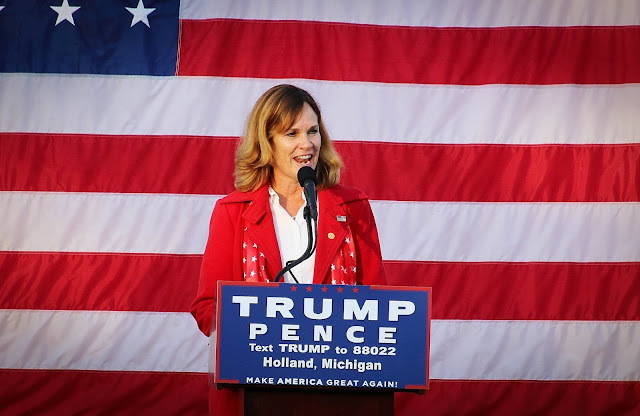 State Rep. Mary Whiteford of Allegan County has been named as a top "emerging leader" by a prominent national Republican organization. "Recently, GOPAC, the Republican Party's premier center for educating and electing a new generation of Republican leaders, released their list of legislators creating the 2018 Class of Emerging Leaders. Michigan State Representative Mary Whiteford is named as a member of this class and is the only legislator named from the state of Michigan. The Emerging Leaders program is a yearlong initiative to coach and develop state legislators from across the country on how to be effective legislative leaders." Whiteford says she was grateful to receive the honor and will continue fighting for Allegan County in Lansing. GOPAC Chair David Avella notes those selected could be on track for higher office. For Whiteford, that could include the State Senate, or replacing Fred Upton in Congress. Whiteford replaced controversial State Rep. Cindy Gamrat after the Todd Courser scandal resulted in her expulsion, defeating Gamrat and Allegan County Commissioner Jim Storey in the primary. 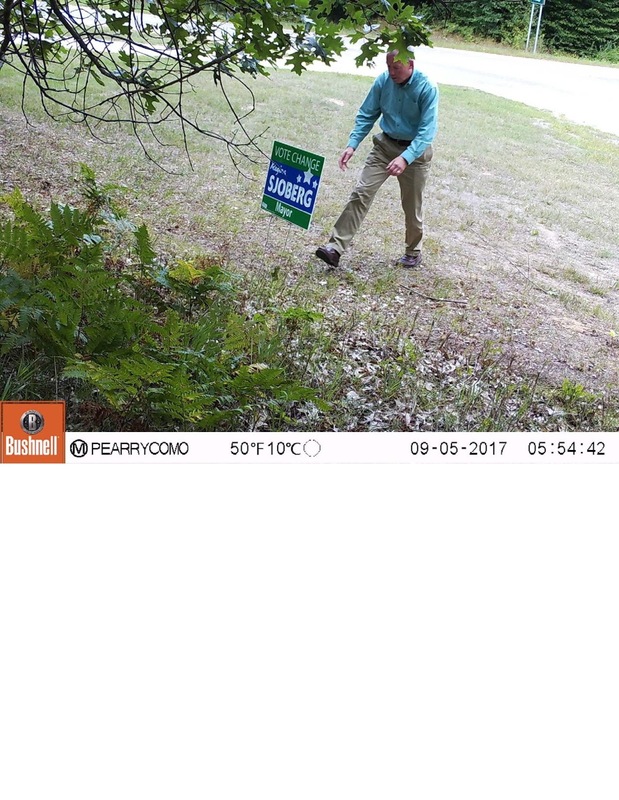 Township Clerk Carolyn Boersma and her husband Tim were facing possible criminal charges after being caught on camera stealing political yard signs. Police also found signs in Carolyn's vehicle. Nothing could be further from the truth. 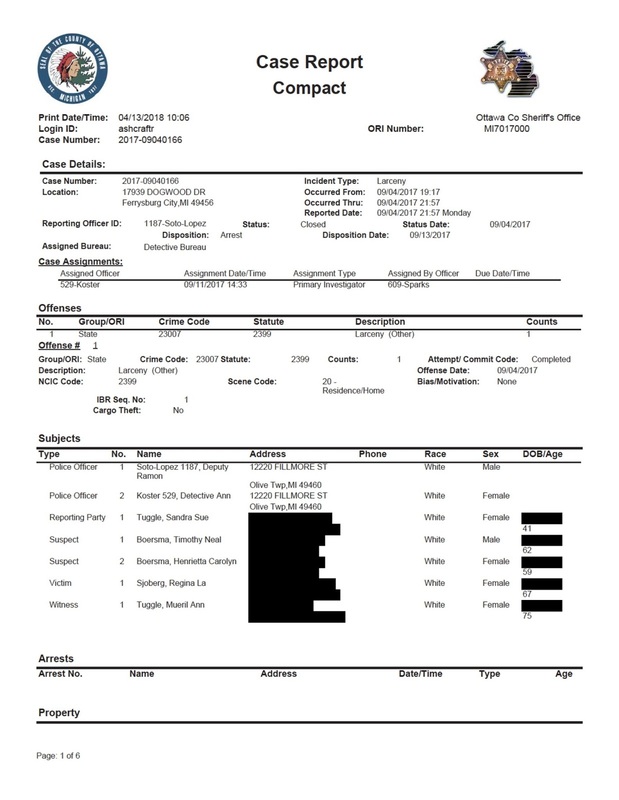 I recently submitted a Freedom Of Information Act request to the Ottawa County Sheriff's Department and obtained the police report related to this incident. 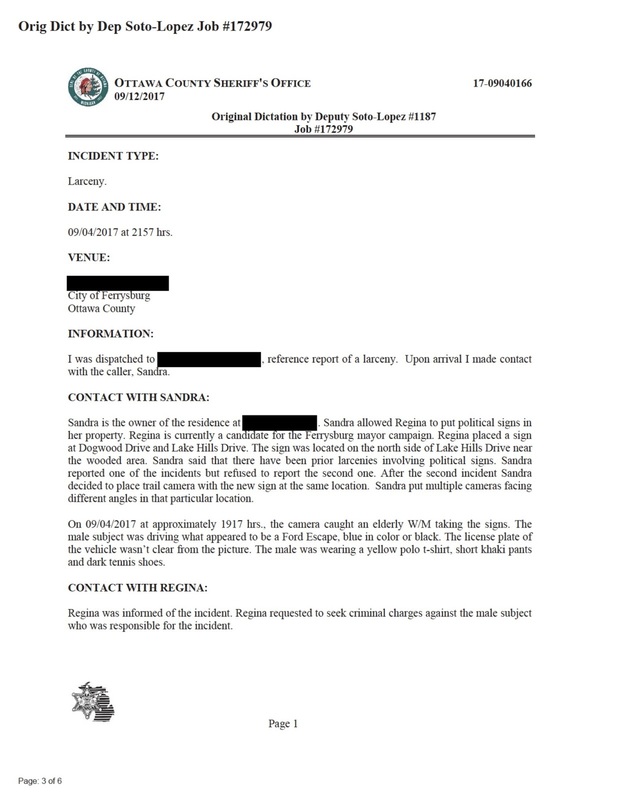 The report proves my website's reporting was completely accurate, the source was correct, and the Tribune's cheap shots were in fact "fake news." 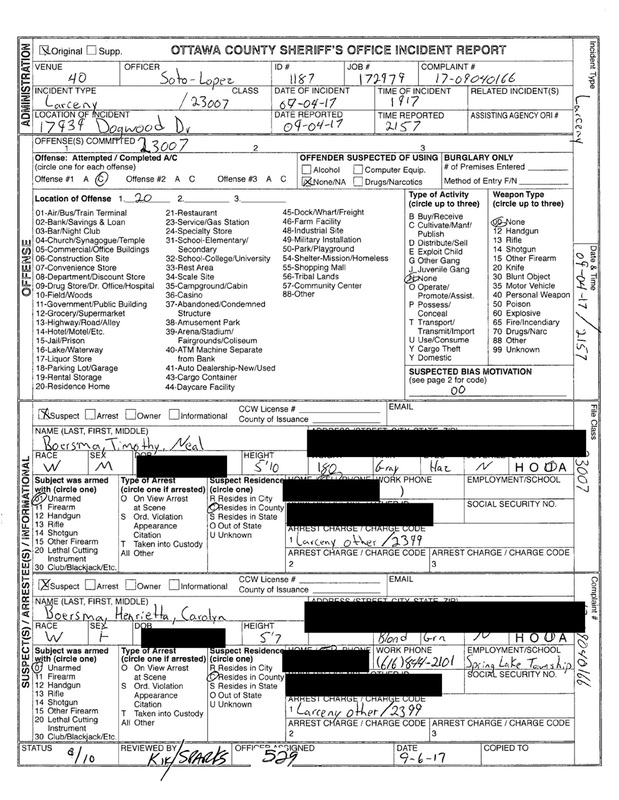 The OCSD requested criminal larceny charges against Carolyn and Tim Boersma on September 13th, but were mysteriously rebuked by Ottawa County Prosecutor Ron Frantz's office. If you or I had done this, we would have undoubtedly been charged. Why was Boersma allowed to skate free? When prosecutors pick favorites and cover up for politicians and local power players, faith in our justice system erodes. Ottawa County residents deserve answers in this case, perhaps now the Tribune can stop attacking me, and focus on the real issue at hand. Republicans are about to send a Michigander to the US Senate: they just happen to be Utah Republicans. The Utah GOP held their nominating convention Saturday, the marquee matchup being the US Senate race Mitt Romney was trying to win. 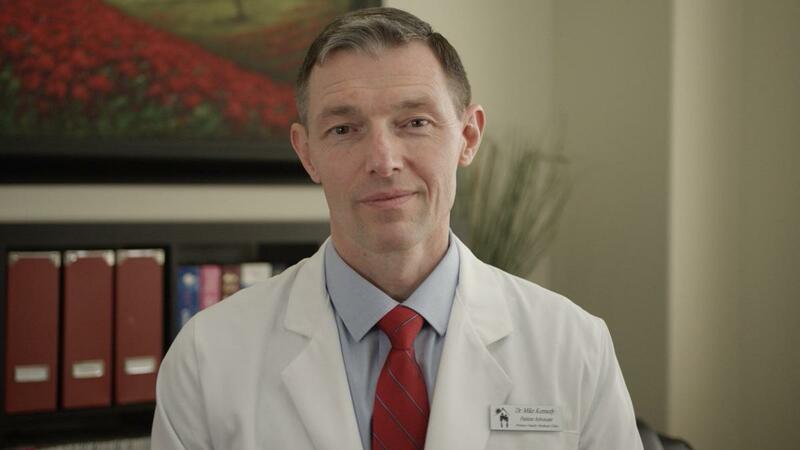 Not only did Mitt fall for short of the 60% threshold needed to avoid a primary runoff, he came in second to Doctor Mike Kennedy! It's interesting that Kennedy, like Romney, was born in Michigan. Kennedy was born in Yipsi, Mitt was born in Detroit. Kennedy went to college at Brigham Young, returning to the Great Lakes State to get his medical degree from Michigan State. Kennedy, a state legislator, is a strong constitutional conservative in the mold of Rand Paul, Mike Lee, and Ted Cruz. ""The federal government should do certain things," Kennedy told Utah media while campaigning ahead of the convention. "Those things have been enumerated in the Constitution, and most of the rest of the things should be dealt with with the people in the states. So, that's a big message. The state, I know this state, I love this state, I've lived in this state. Utahns deserve a serious conversation about our future and I'm prepared to have it." With the news today that Debbie Stabenow has over $8 million on hand, this may be the closest Michigan gets to a Republican Senator... Best of luck to Dr. Mike Kennedy! Unbelievably, after President Trump graciously endorsed him in this race, Mitt Romney refused to back the President for re-election in 2020 when asked about it before the vote over the weekend. 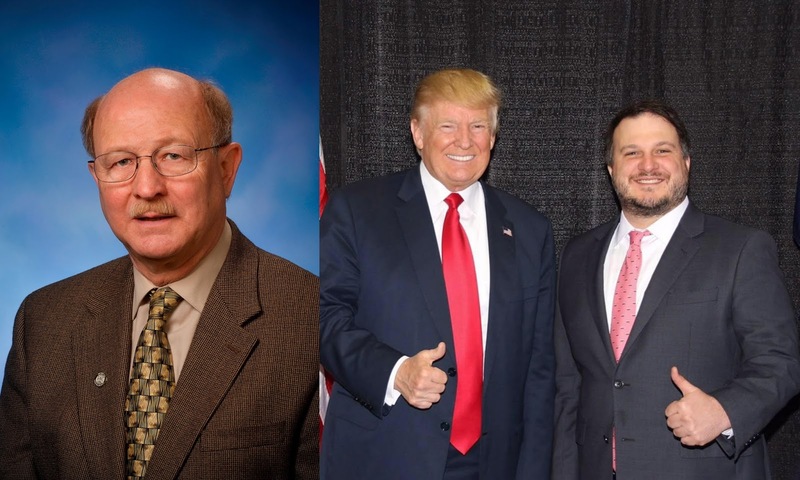 State Rep. Lee Chatfield is well positioned to be the next Speaker of the House in 2019, and now the Northern Michigan lawmaker, busy helping House Republicans maintain their majority as HRCC Chair, has drawn a primary challenger. His name is Bruce Newville, and he lives just a mile away from Chatfield in Pellston. Evidently, he's a Vet who used to sell the Chatfield family pizzas. Chatfield's war chest is well equipped to handle Newville's challenge, with over $100,000 on hand. Newville tells MIRS one of his priorities is to cut legislative staff from 10 to 5, but almost all legislators only receive two staffers. "Let's cut the stuff in Lansing that doesn't really need to be there. I don't know, I've never been there, but if you've got 10 people working in your office, let's cut back. Let's cut it down to five. You don't need 10 people. Let's cut back. Let's save money somewhere." Chatfield tells MIRS he's ready. "I like primaries," Chatfield said. Judge Rosemarie Aquilina famously told the women assaulted by disgraced Michigan State University Doctor Larry Nassar to "go out and do your magnificent things." For Aquilina, when it comes to MSU President John Engler and the MSU Board of Trustees, they can just go. Aquilina posted a video in support of Nassar survivors calling for Engler and the Board to resign on her Facebook over the weekend, saying she was proud of them, also noting the university doesn't seem to know how to handle the situation. "So PROUD of you! They can’t keep up with you and your Sister Survivors," Aquilina said. "They have no idea just how fierce you and your ARMY is...Magnificent Voice, Power, and Grace!" Aquilina also "loved" multiple comments from people saying it's time for Engler and the MSU Trustees to leave. "MSU's board of trustees made a huge mistake hiring a bully to be the interim president. But they don't realize it because maybe they all think alike? It's way past time for them to resign," one person said. "john engler did nothing but caused more problems," another commented. Engler's brash style, as well as a series of dumb comments by trustees, have fueled calls for them to go. Aquilina, who has been an Ingham County Circuit Court Judge since 2009, catapulted onto the national stage after her scathing sentencing of Nassar a few months ago made her a household name. 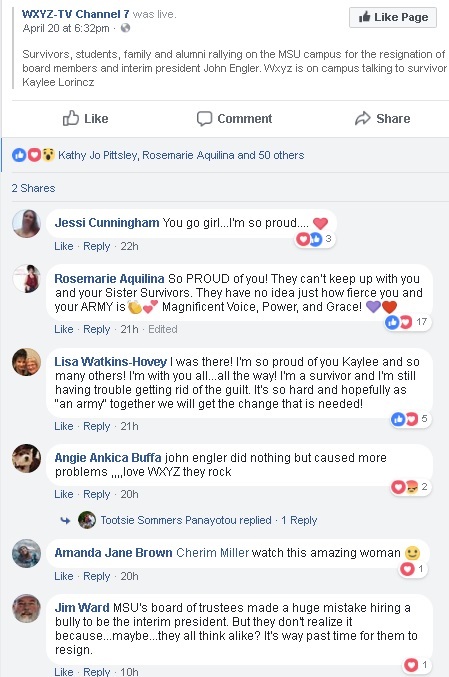 For many impacted by Nassar's evil acts, Aquilina was the first person in the system to actually listen to what they had to say-and believe them. Aquilina turned down calls for her to run for Attorney General or the Michigan Supreme Court this year, saying it wasn't the right time and she will remain on the bench. 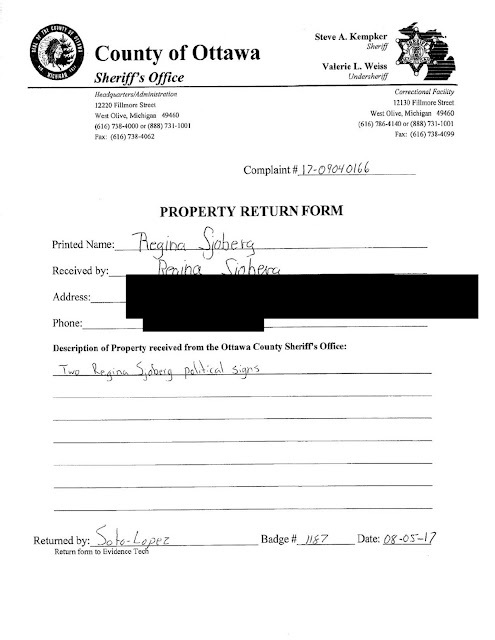 The Ottawa County Sheriff's Department sought criminal larceny charges against Spring Lake Township Clerk Carolyn Boersma and her husband Tim for stealing yard signs last fall during a heated Mayor's race in Ferrysburg, documents obtained by West Michigan Politics reveal. The charges were rejected by Ottawa County Prosecutor Ron Frantz's office despite Boersma being busted by police with signs in her car, Boersma's husband repeatedly caught on a trail cam taking signs at the behest of his wife, as well as the fact Boersma's actions are in direct violation of Spring Lake Township's legal ordinance specifying procedures for how to deal with removing residential political yard signs. 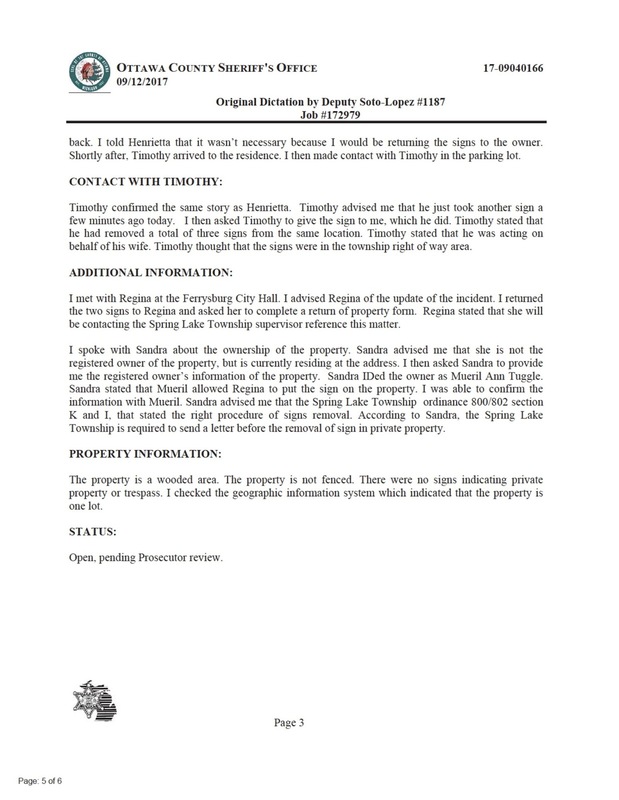 Spring Lake Township resident Sue Tuggle was furious. Tuggle was sick of someone repeatedly stealing her "Sjoberg for Mayor" yard signs, she emphatically wanted her friend Regina to win the upcoming Mayor's race in neighboring Ferrysburg against Rebecca Hopp. Hopp, like Sjoberg, was a member of the Ferrysburg City Council. When the first heist transpired, she reported the incident to the police. However, the second time, Tuggle decided to take matters into her own hands. Instead of calling the cops again, she bought a couple "trail cams" to try and bust the culprit in the act. 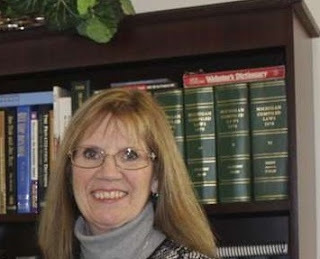 Little did Tuggle know, that new trail cam would soon implicate Spring Lake Township's top elections official, Clerk Carolyn Boersma, subsequently putting Boersma on the brink of criminal charges. On the night of September 4th, the sign bandit struck again, clueless to the new trail cams documenting his every move. Ottawa County Sheriff's Deputy Soto-Lopez was subsequently called to Tuggle's home. 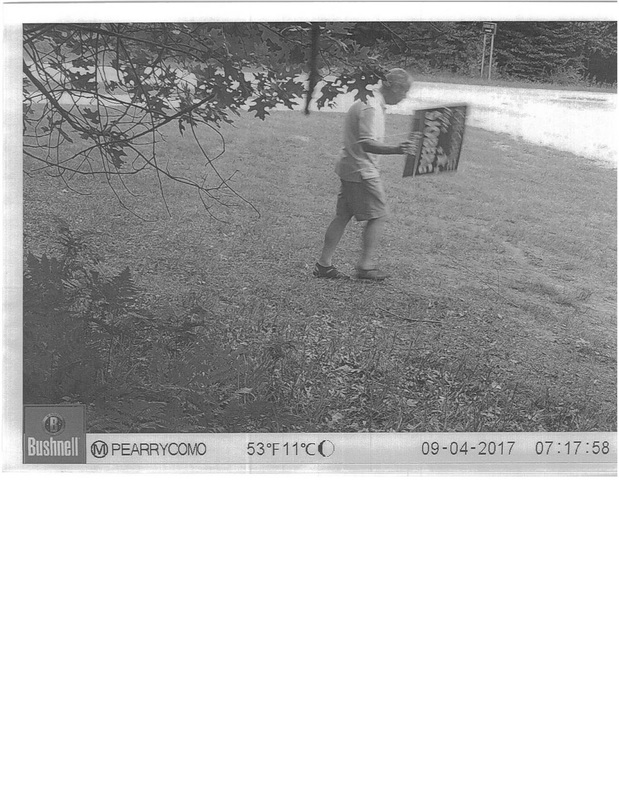 Upon arrival, he discussed the theft with her, as well as received a copy of the trail cam footage. Soto-Lopez then called Sjoberg to see if she wanted to pursue criminal charges, which she affirmed she did. As he studied the footage, Soto Lopez knew he had seen the unknown perpetrator before: he recognized him from a Ferrysburg City Council meeting, but did not know his identity. 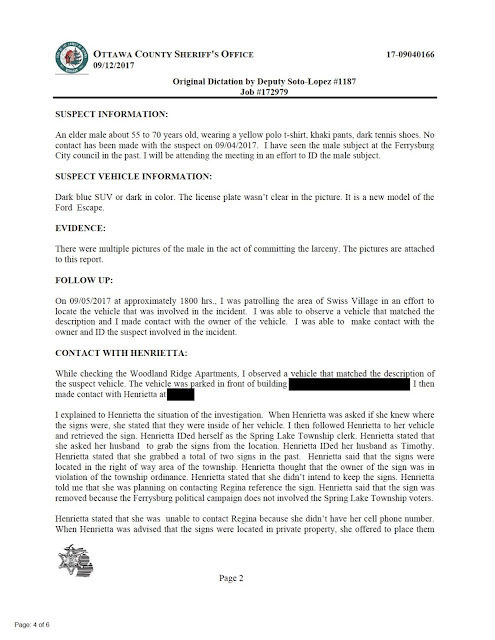 The next evening around 6, Soto Lopez hit the road in the area of Swiss Village/Woodland Ridge in an attempt to locate the suspect's vehicle. 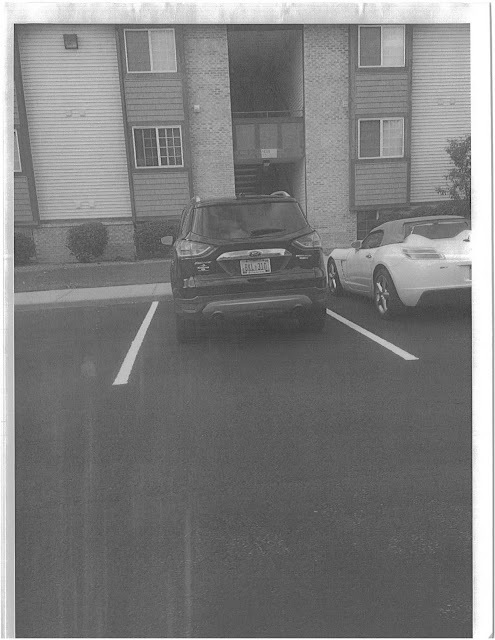 The plate wasn't clear from the cam video, but it was definitely a new Ford Escape, dark in color. Soto-Lopez found the vehicle and then made contact with the owner, who turned out to be none other than Spring Lake Township Clerk Carolyn Boersma. 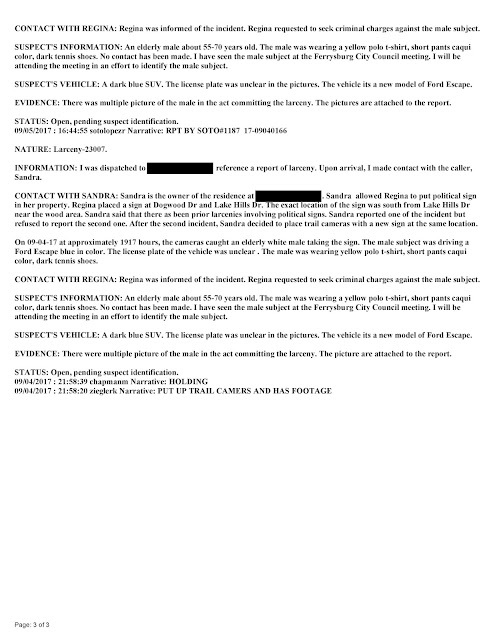 "While checking the Woodland Ridge apartment, I observed a vehicle that matches the description of the suspect?s vehicle. The vehicle was parked on front of I then made contact with Henrietta at apartment 7. I explained Henrietta the situation. When Henrietta was asked if she knew where the signs were, she stated that it was inside her vehicle. I then followed Henrietta to her vehicle and retrieved the sign. Henrietta identified herself as the Spring Lake Township clerk. Henrietta stated that she asked her husband to grab the signs from the location. Henrietta identified her husband as Timothy. 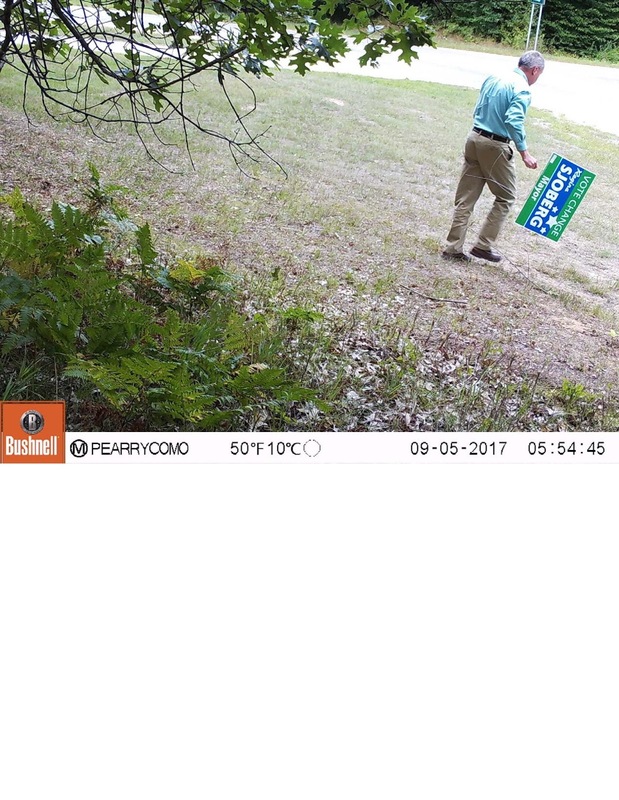 Henrietta stated that she grabbed a total of two signs. 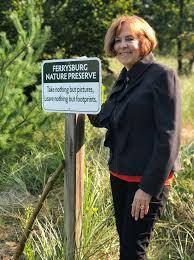 Henrietta said that the signs were located in the right of way area of the Township. Henrietta thought that the owner of the sign was in violation of the Township ordinance. Henrietta stated that she didn't intended to keep the sign. Henrietta told me that she was planning on contacting Regina reference the signs. 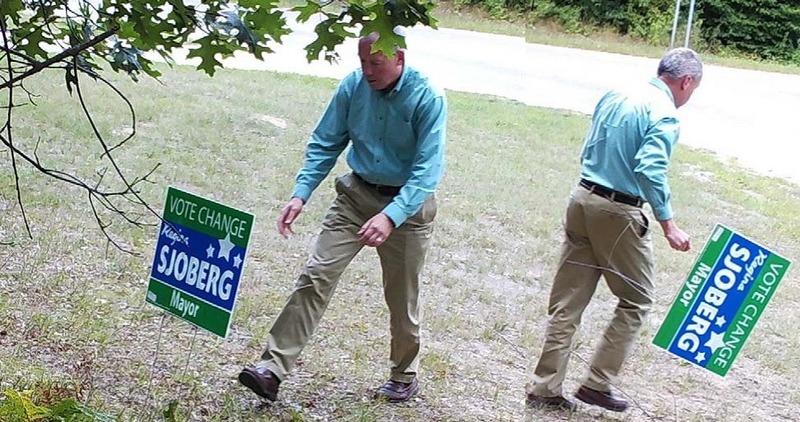 Henrietta said that the sign was removed because the Ferrysburg political campaign doesn't involved the Spring Lake Township voters. 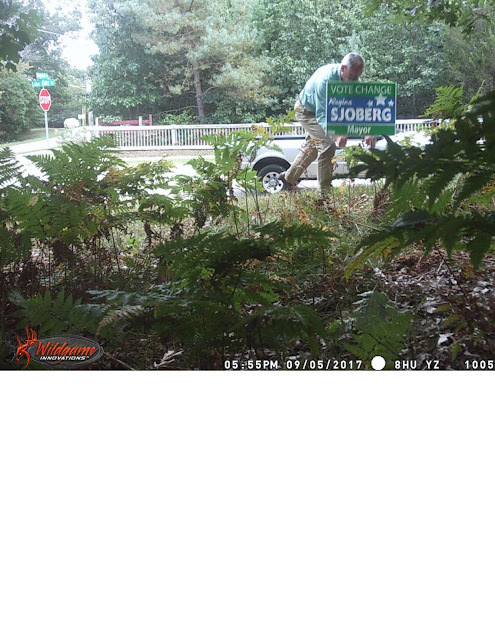 Soto-Lopez rebuked Boersma's offer to return the stolen signs, telling her he would return them himself. "Henrietta stated that she was unable to contact Regina because she didn't have her phone number. When Henrietta was advised that the signs were located in private property she offered to place them back. I told Henrietta that it wasn't necessary because I will be returning the sign to the owner. " 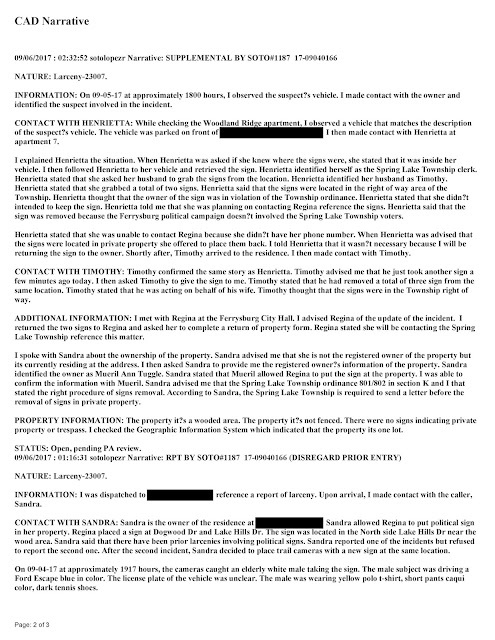 That's when Boersma's husband Tim showed up to the apartment. "Shortly after, Timothy arrived to the residence. I then made contact with Timothy. Timothy confirmed the same story as Henrietta. Timothy advised me that he just took another sign a few minutes ago today. I then asked Timothy to give the sign to me. 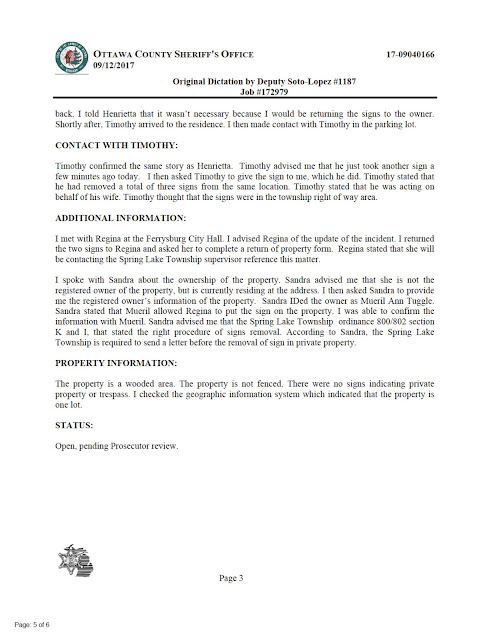 Timothy stated that he had removed a total of three sign from the same location. Timothy stated that he was acting on behalf of his wife. Timothy thought that the signs were in the Township right of way. " 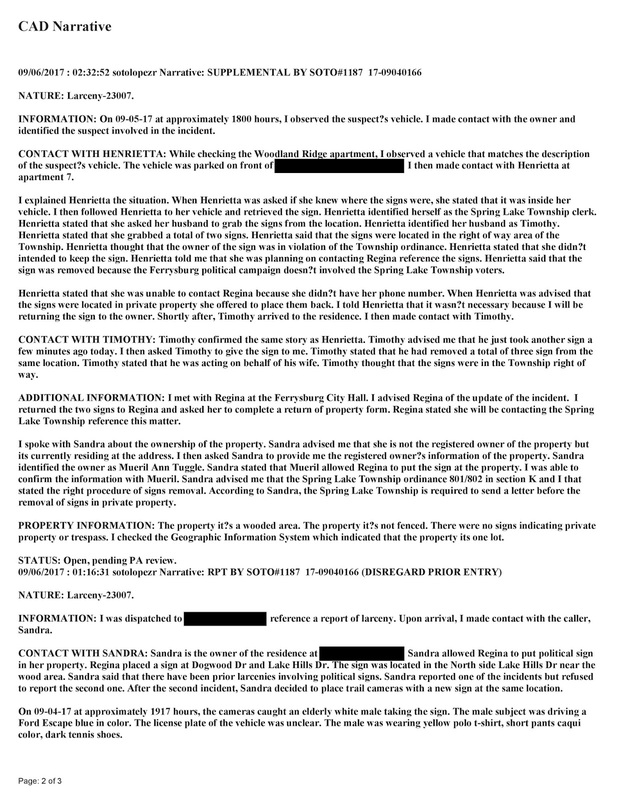 Both Boersma's provided written statements confessing to the sign heists. "I was with Tim on several occasions (taking signs)," Carolyn said. Tim admitted to taking signs three times, "two of which were in the presence of my wife," he said. Soto-Lopez's report notes that Boersma violated Spring Lake Township's ordinance on yard sign removal. "Sandra advised me that the Spring Lake Township ordinance 801/802 in section K (is) the right procedure of signs removal. 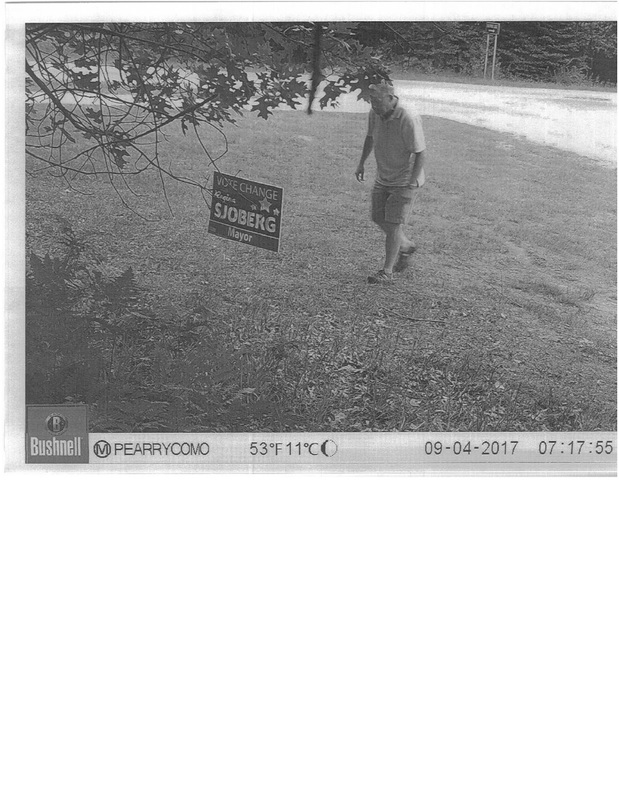 According to Sandra, the Spring Lake Township is required to send a letter before the removal of signs in private property. " 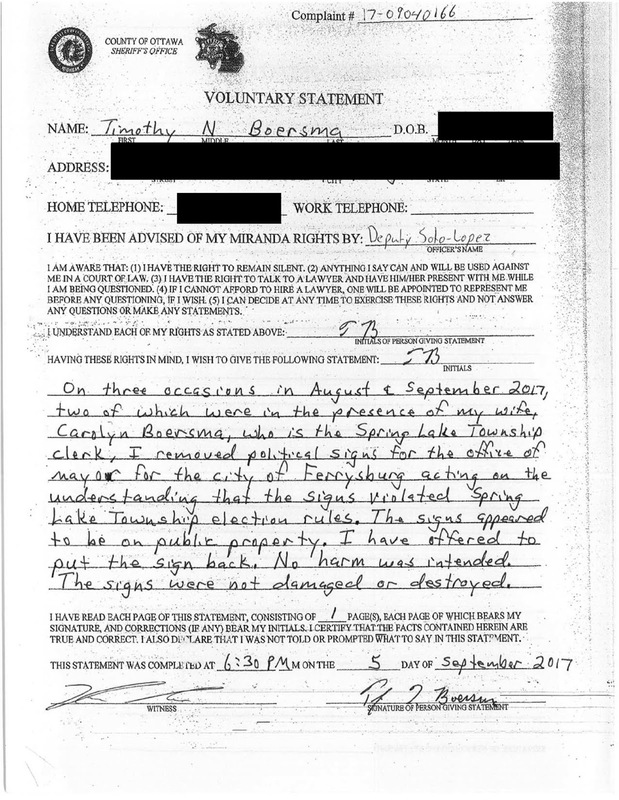 Criminal charges were requested on September 13th, but the Ottawa County Prosecutor's office refused to move forward despite significant evidence. Editor's Note: WMP broke the story last fall, and was outrageously (and erroneously) accused by the Grand Haven Tribune (a paper I respect overall) in an editorial of peddling "fake news" and utilizing "alternative facts." In this case, "citizen journalism" and the truth prevailed over the corporate media at the end of the day.